Home » Beauty Pageant National Costumes » Latest » Miss World 2018 » Miss World 2018 National Costumes » Sashes and Tiaras » Sashes and Tiaras Miss World » SASHES AND TIARAS.....Miss World 2018 "Dances of The World" National Costumes! 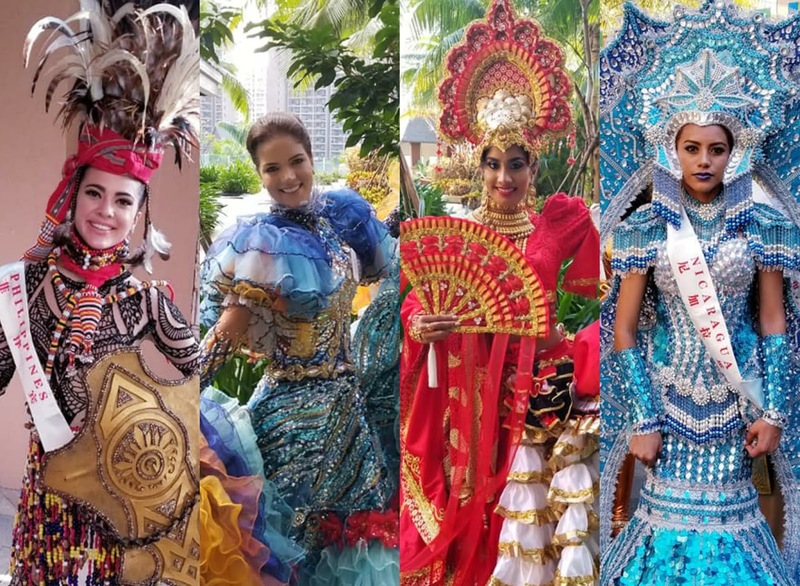 SASHES AND TIARAS.....Miss World 2018 "Dances of The World" National Costumes! 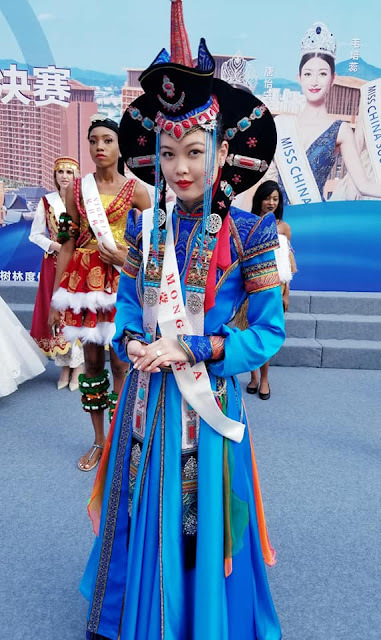 The 68th edition of the world's biggest international beauty pageant--Miss World--is taking place in Sanya China with the finals taking place on December 8th. 120 contestants (120!) have been in China gearing up for the Finals doing various pre-Finals events, activities and actual competitions. One of the many events that they participate in is the "Dances of the World", where contestants get to show off traditional dances from their respective nations and as a bonus, they get to wear a costume for it. 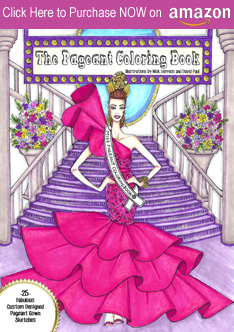 Since the Miss World pageant did away with their "National Costumes" portion many years ago, this has become a replacement of sorts--for those pageant fans that love this part of international beauty pageants (myself included!). 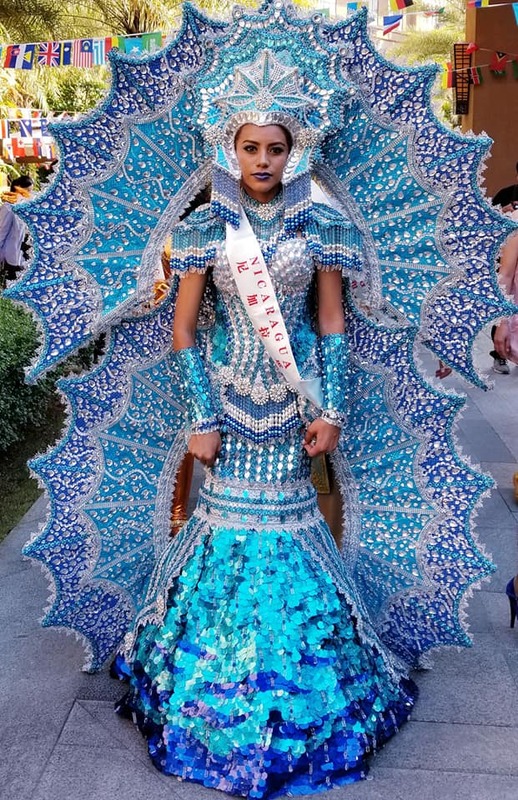 Miss World Nicaragua Yoselin Sobeyda Gomez--One of my favorite costumes at this year's Miss World is this blue sequined design from Miss World Nicaragua. I loved the impacting colors which transform her into a Marine Mermaid Pre-Columbian Carnival Diva! It was designed by Carlos Nicaragua and whoever sewed on all of those paillettes and sequins should get an award just for that! 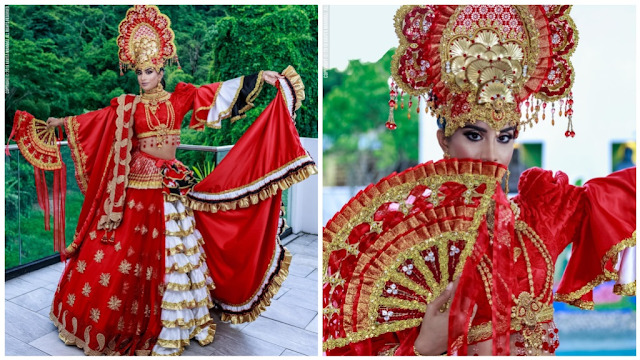 Miss World Trinidad and Tobago Ysabel Bisnath--Entitled “Celebration of Our People", this design is a standout among the National Costumes from the Miss World 2018 "Dances of the World". Designed and executed by head designer, Franklyn Jagdeo Of Hott Stuff Promotions, along with Rickey Sookdeo and Tara Rampersad, the costume features the multicultural heritage of the Caribbean nation with its East Indian, Afro-Caribbean influences. 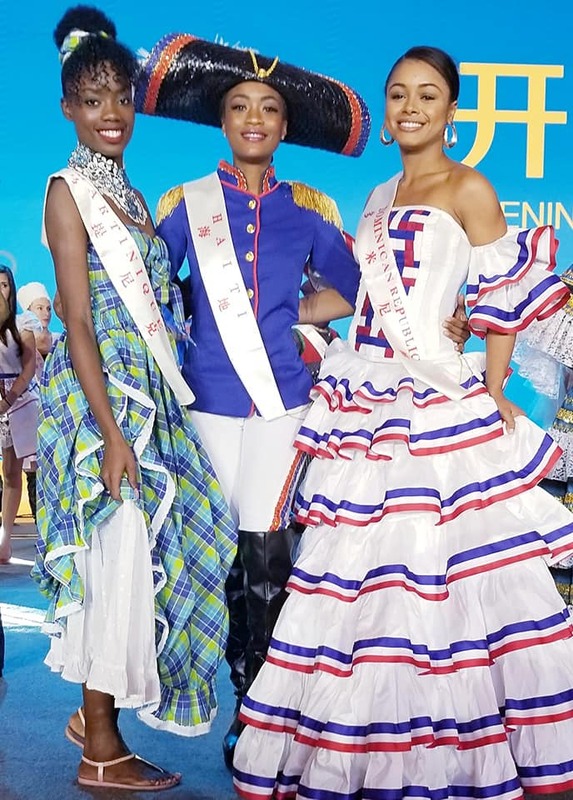 I love everything about it, including the Indian midriff top, headdress, sari-like inspiration plus the tiered ruffle skirt ever-present in the Caribbean Island's traditional dresses. This was literally EVERYTHING! 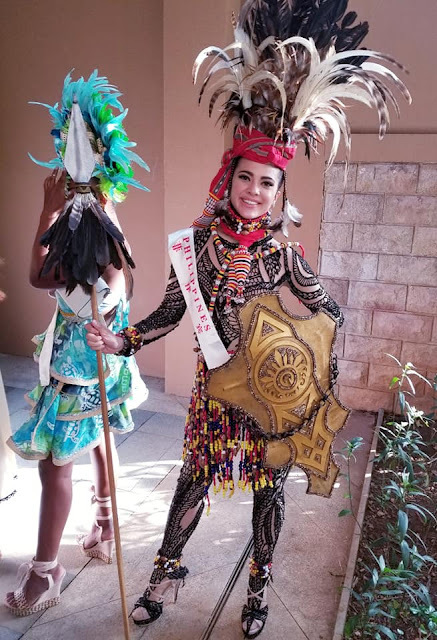 Miss World Philippines Katarina Rodriguez--This costume was inspired by the Kalinga Warrior. Designed by Francis Libiran, it featured a fully embroidered and sequined body suit accessorized with a custom-made headdress with feathers featuring the iconic "bongol"--the native beads to show the social status of the Kalinga woman. This national costume also pays homage to Whang-od, the last surviving original, from Kalinga's Butbut tribe. The costume is fashionable and tribal-fab! Miss World Venezuela Veruska Ljubisavljevic--Veruska wore this costume, created and designed by Wilfredo Camacho, depicting the traditional Venezuelan national dress and the dance including flora and fauna, and everything in between! This colorful and very festive national costume said "Viva Venezuela"! Miss World Mongolia Erdenebaatar Enkhriimaa--I loved this costume for the colors, dramatic headdress and overall beauty. The blue, orange, green and red colors as well as traditional Mongolian textile prints, sequin details, texture, beauty and overall strong National costume impact. 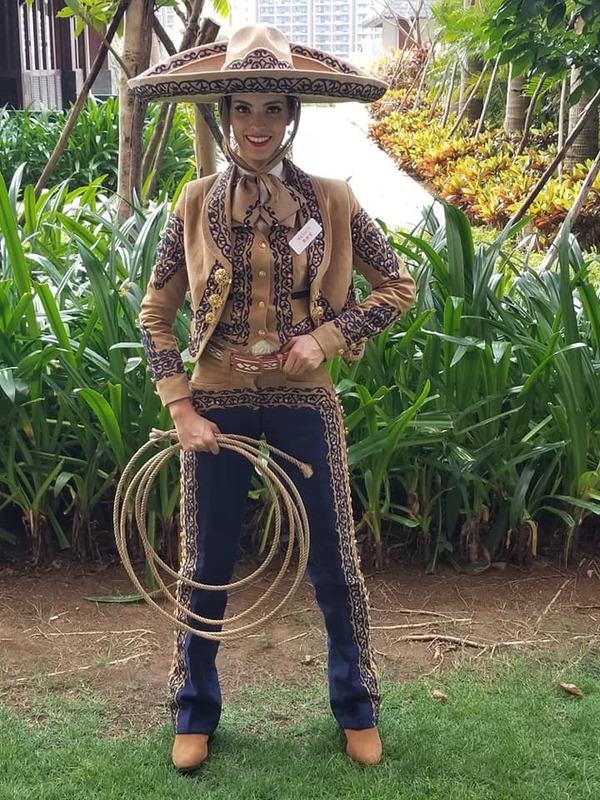 Miss World Mexico Vanessa Ponce--As National Costume "basic" as this look is, it is still so fabulous! I LOVE a traditional Charro look--the horseman--or vaquero--outfit that the Mexican Charros wear. The entire outfit is so perfecto! 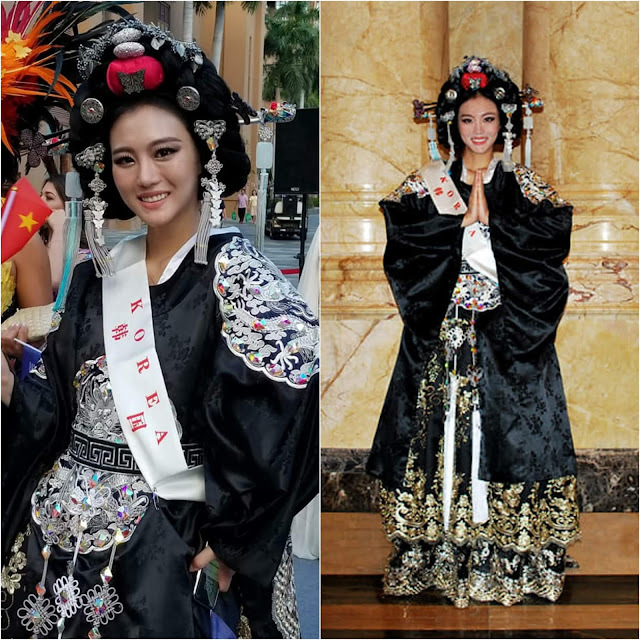 Miss World Korea Bo Ah Cho--Korea's contestants always wear gorgeous costumes and this one worn by Miss World Korea's 2018 beauty is no exception. It is exceptional in its design, stage impact and blends both traditional with high style. 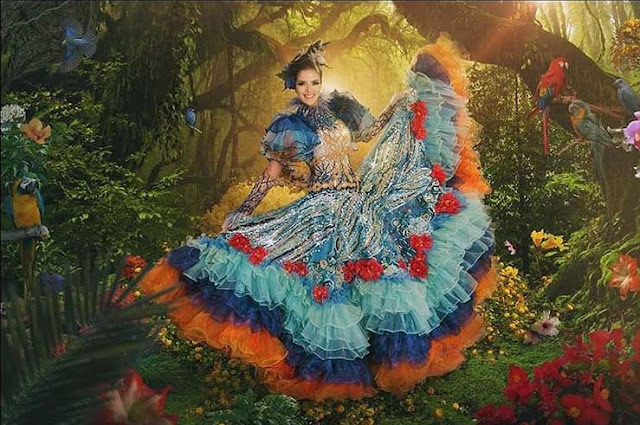 Miss World El Salvador Metzi Solano--I adored this outstanding costume worn by Miss World El Salvador. I thought the colors, fabrics (the gold trim, white laces), multi-tiered skirt and that STUNNING Virgin-like head wrap with orchid "crown" were all gorgeous. This was an exceptional example of a national costume! Muy lindo. 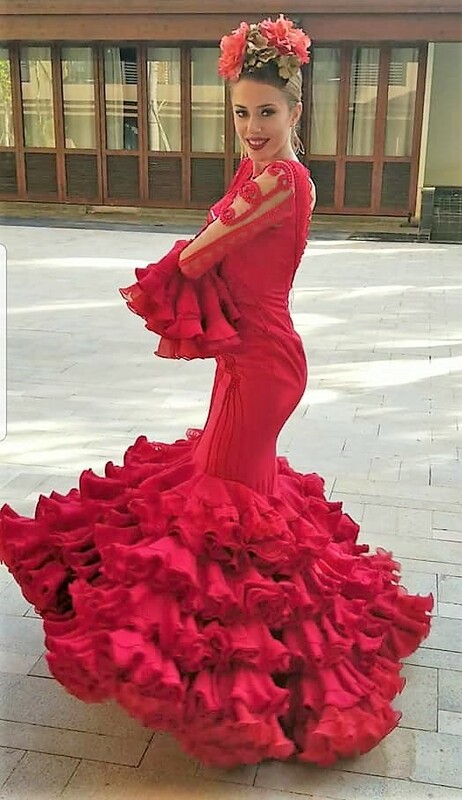 Miss World Spain Amaia Izar--It is not a shock that Miss World Spain would feature a Spanish Flamenco dress as her "Dances of the World" costume. 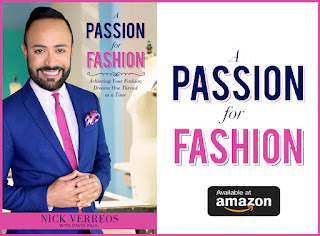 I love these dresses and think they are iconic, fabulous and very stylish. This red ruffled design was a great example of a wonderful "Sevillana". All I want to do is get a couple of castanets and start flamenco dancing with her! Miss World Russia Natalya Stroeva--Natalya is the first Russian beauty queen of Asian heritage to represent her nation at Miss World. 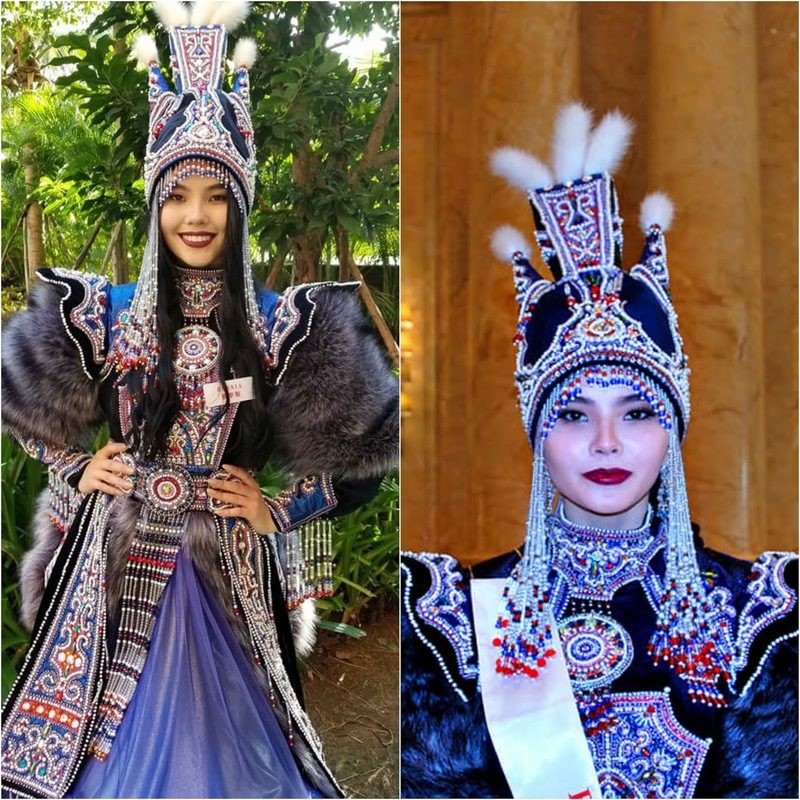 She is wearing a traditional costume from the Republic of Sakha (Yakutia) in Russia which she was the representative of for her national pageant. The costume featured intricate bead work, shimmering colors, a stunning headdress and fur sleeves. 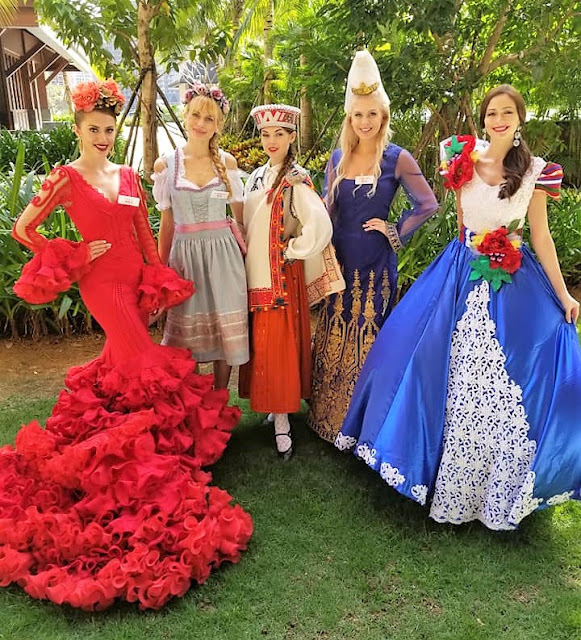 It all added up to one of my favorites from Miss World 2018 "Dances of the World" National Costumes. 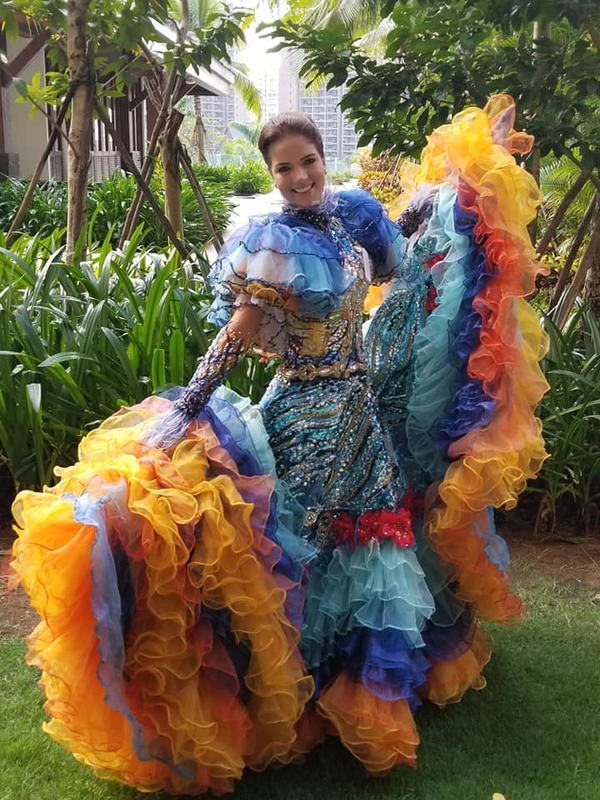 0 Response to "SASHES AND TIARAS.....Miss World 2018 "Dances of The World" National Costumes!"